Happy August, everyone! I'm going to be totally cliche for a second, because I just have to exclaim how I can't believe how fast August has arrived this year. Summer is winding down! On that note, it's been about a month since I've updated on our garden. Let's just say the crazy-hot summer paired with my regular waterings and a few storms we've had recently have been the recipe for a pretty bountiful garden at this point. It's amazing to see how things can change in almost six weeks! I thought I was planting a little more sparsely this year, if only to avoid all the vegetation spillage outside of the garden's walls, but as you can tell in the case of this squash plant, these crops have a mind and a surface area of their own. On the other hand, though I decided not to plant watermelon this year, one popped up all on its own! The seed had saved since last year and decided this was the year it was ready to grow. The watermelon looked like it was growing nice and full, but when I went to check on its status last week, the entire bottom had rotted out. Poor thing. I was really pulling for the underdog on this one! My green peppers plants are both doing well, however! I picked a nice-sized pepper a couple of weeks ago, which we sliced up and grilled... delicious! This green pepper will probably meet a similar fate, as I picked it shortly after I snapped this photo. 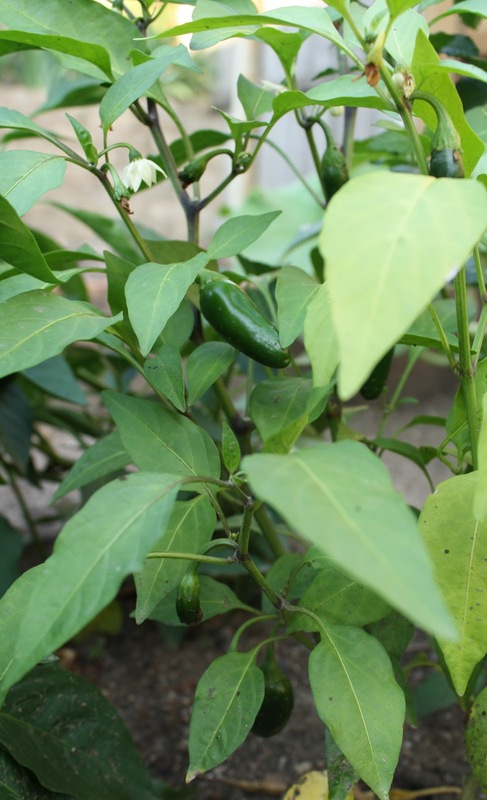 Next to the green peppers is my jalapeno plant. It's been producing a steady crop of peppers the past couple weeks, which have been added to omelets, salads and homemade hummus! The bush beans are also fairly prolific; I picked a bunch last week, and there are quite a few left for me to pick in the coming week. There's not much better than fresh green beans in the summer. This monstrosity you see is a bedlam of our soon-to-be bounty of butternut squash... I planted two rows because Eric assured me he'd eat squash for every meal once they were harvested, and I'm starting to think those three meals a day of squash may be happening for both of us. These vines are taking over everything! Shortly we should have delicious squash by the armful. We'll be doing plenty of roasting, pureeing and making soups this fall, I'm sure! I just love the squash blossoms - the pops of deep yellow here and there make the garden look so pretty! 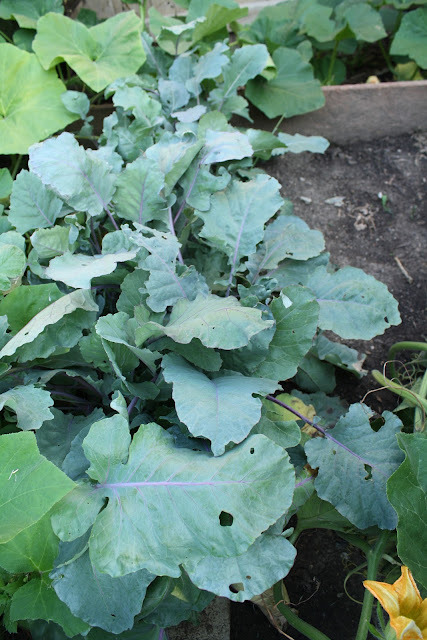 This blueish-green section of the garden is a patch of kohlrabi. It's Eric's favorite vegetable, so I promised to grow some for him, although I'm not very familiar with it myself. 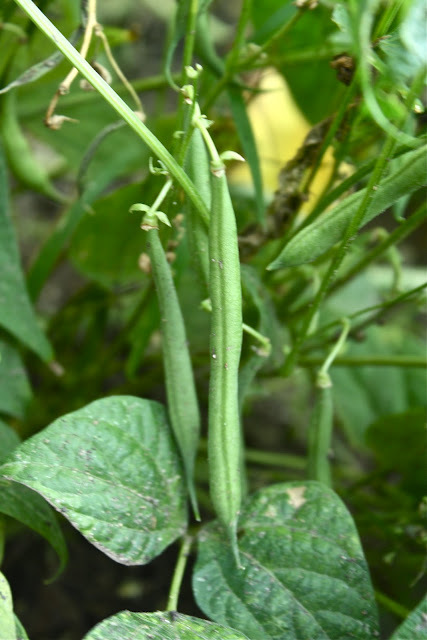 The "meat" of the plant grows above ground, and here's a look at how it develops early on. I hope these turn out okay! 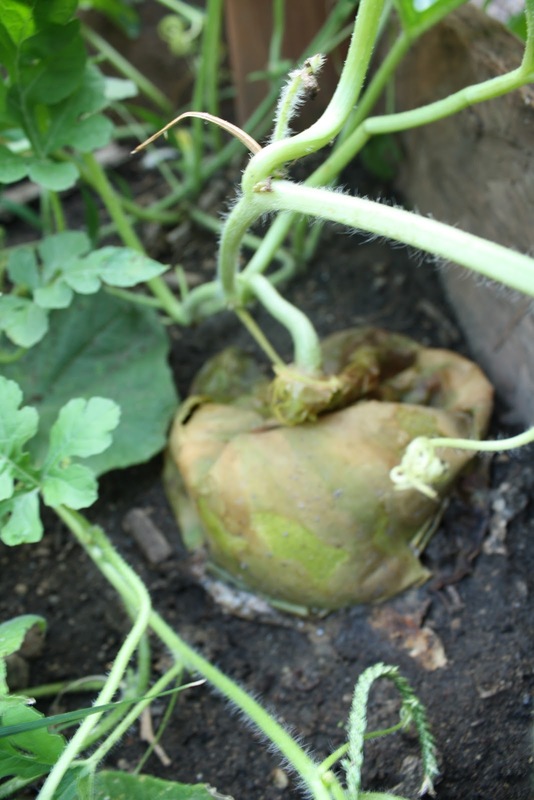 I love watching the vegetables at various stages of growth - they can take on some pretty wild forms. 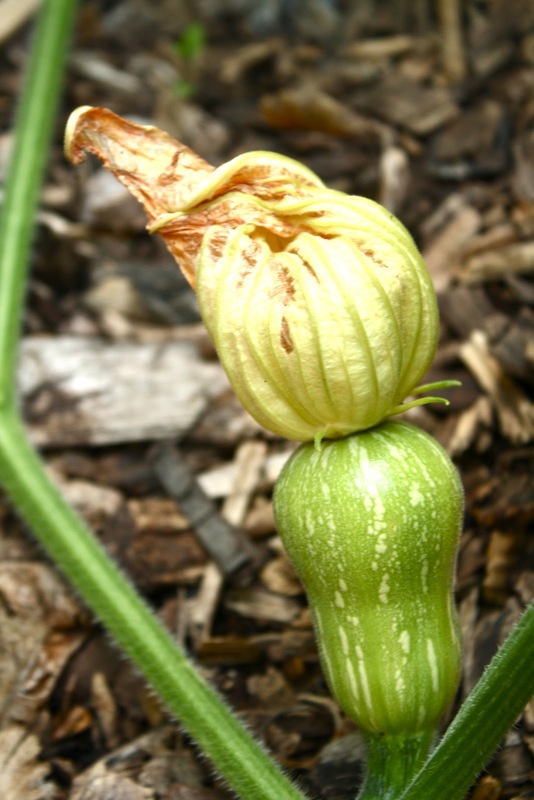 Like this budding squash with a little blossom hat. Speaking of the cucumber plant, I just realized I didn't take any photos of it! Much like last year, the cucumbers are just popping up like crazy. I've already picked about 10 cukes, while another four or five have begun to rot (and were hidden under all the squash leaves!) before I could pick them. 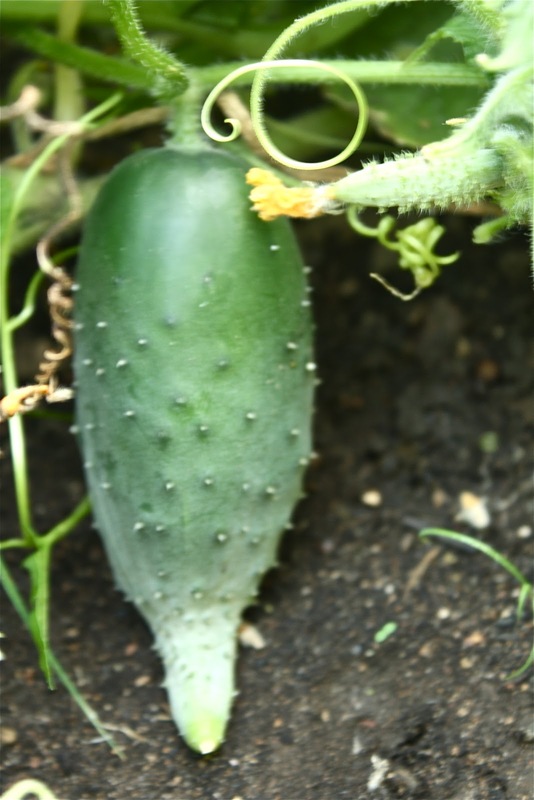 If anyone wants any cucumbers, please let me know - I'd love to pass some along before they go bad! My basil plant has really taken off, too! I know how out-of-control it can get, so I tried to plant a little less this year - I'm still going to have too much as it is! 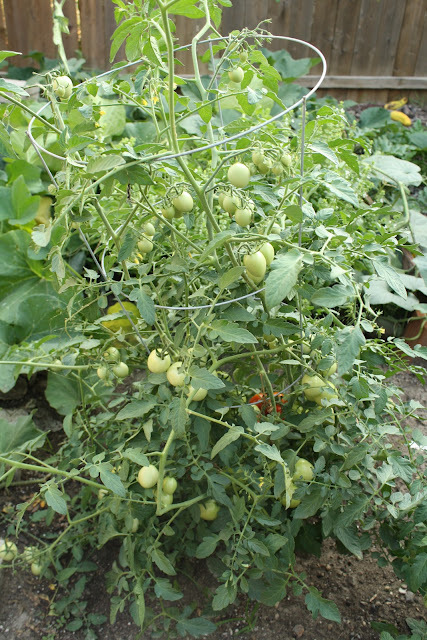 And finally, the tomato plants that I was getting a little worried about in the beginning have just exploded! While most of the 'maters are still green, there was a little bunch right in the middle of the plant that had three perfectly red, ripe and ready-to-go tomatoes cleared for picking! The little tomato with the vine still attached is just the cutest, isn't it? Or.... am I the only weirdo who describes food as "cute?" Anyone? Even if I do get a little too excited about the produce from my garden, I'm happy about the way it's turning out! Things are flourishing despite the drought we've had this summer, and nothing beats the feeling of running out in your own backyard to grab ingredients for a meal. Can't get more organic than this, folks! Do you have a garden at home? How's it been this summer? 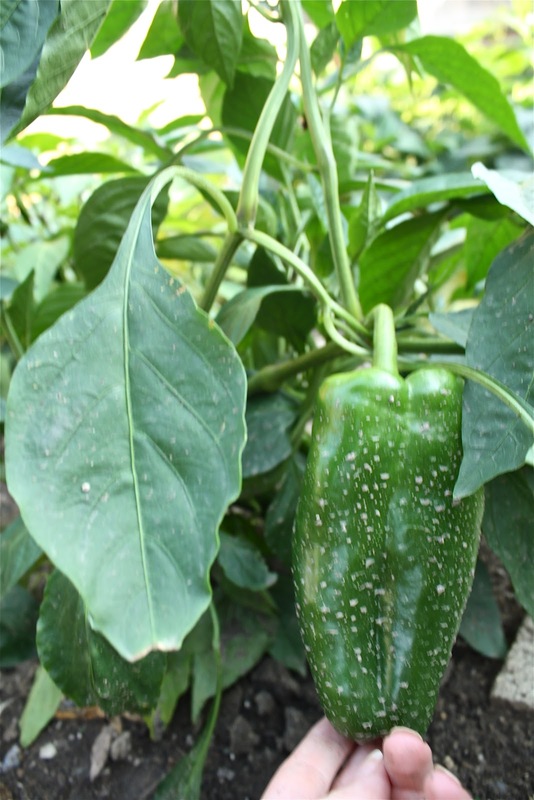 If it's been dry where you live, has it affected your plants at all?